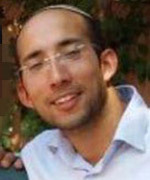 29-year-old Rabbi Itamar Ben-Gal stabbed to death in the Israeli city of Ariel in Samaria. Rabbi Itamar Ben-Gal, 29, father of four, was murdered in a stabbing attack Monday afternoon (5 February 2018) at a bus stop near the entrance to the city of Ariel in the Samaria region of the West Bank. He was treated by civilian and military medical personnel at the scene of the attack before being evacuated to the Rabin Medical Center in Petah Tikva, where he succumbed to his wounds. Originally from Rehovoth, Ben-Gal lived with his family in the Har Bracha settlement on the outskirts of Nablus. He was a middle school teacher at the Bnei Akiva yeshiva in Givat Shmuel, near Tel Aviv. Well-loved in his community, he is survived by his wife, Miriam, and their four children. His funeral took place on Tuesday (February 6, 2018) at the Har Brakha cemetery.